Mix rice flour with required hot water and salt. Knead into smooth dough. Apply little oil or ghee over the dough and insert into the cooking press. Put a small quantity of dough into the cooking press and press it on the idly moulds greased with oil. 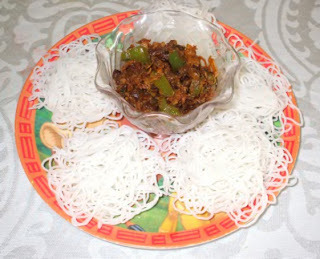 Sprinkle grated coconut on top of each appams. Steam the idly cooker for 8-10 minutes. Serve the Idiyappams, with Potato stew, egg curry,kadala curry or with milk and sugar. when i make idiyappam its soft as soon as i take it out of steamer.after an hour its more hard . any tips to keep it soft for long time. hi danya,I hope if we add little oil or ghee into the dough it might help u...I normally keep in a caserol..Tht helping me to keep soft.